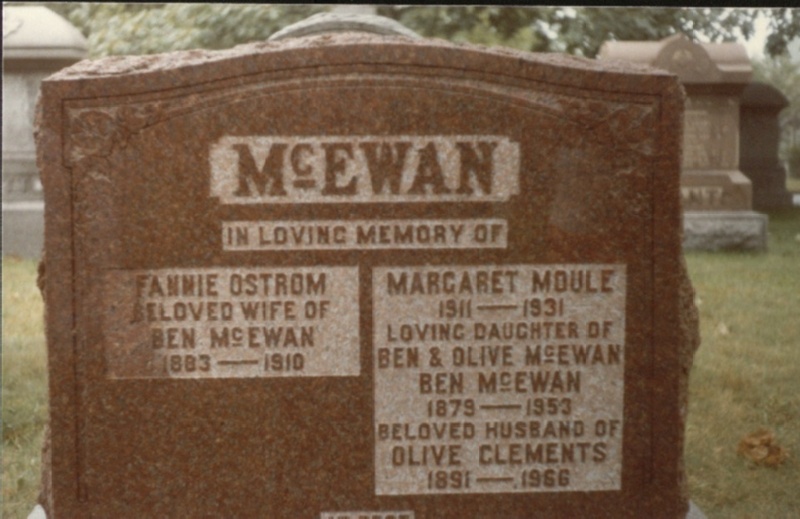 Benjamin was the ninth child born to John McEwan and Janet Stevenson, born September 29th 1879, in Toronto. He was my grandfather though I never knew him. His first wife and my grandmother was Frances Gertrude Ostrom (1883 – 1911). They were married in Toronto in 1900. In their short marriage they had six children of which three survived, my mother being the youngest survivor. May Irene (1900 – 1901), John Benjamin (1901 – 1901), (Frances Munro (1902 – 1985), Edgar Irwin ( 1905 – 1990), Lilly (1908 – 1998), baby (1911 – 1911). Benjamin’s second wife was Olive Clements (1891 – 1966). They married 1911 in Toronto and had five children from their marriage. Margaret (1911 - 1931), Kenneth Roy (1912 - 1973), Harvey B (1915 - 1992), Marie (1918 - ? ), and Bernice (aft 1921 - ?). Benjamin was a furrier and worked for Reilly and Company in Toronto. He died in 1953, and is buried with both wives and Margaret at St-John’s Norway Cemetery and Crematorium, Toronto, Ontario. *more on Benjamin McEwan and Frances Ostrom.